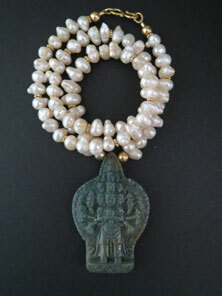 A wonderful amulet necklace with an intricately hand carved Jasper 1000 armed Bodhisattva pendant from Burma. Bodhisattva embodies compassion. The pearl has always captivated me by its gentle allure, surviving throughout past civilisations as a graceful and elegant gift to jewelry design. Centre-drilled irregular white freshwater pearls complete the necklace with gold vermeil Bali daisy spacers beads, end beads and gold vermeil S-hook clasp.